We are a rafting family. We solidified that when we bought a raft five years ago. Since then, we've had many adventures, on many rivers, and met a plethora of good friends along the way. We call these friends our "river family". 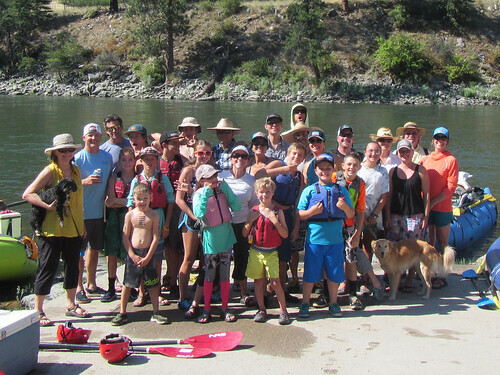 Our river family gathers every January and chooses where we want to apply for river permits. We wait for a couple months until permits are granted. A person or two usually gets a permit granted, then the planning begins! This year, we were granted a permit to float the main fork of the Salmon River in Idaho. We started our journey just over a week after rafting, hiking, and enjoying life in Montana. It was a long drive (878 miles / 1448 km) from our house. It took two days to drive there and we stopped in Pocatello, Idaho to rendezvous with my dad along the way. He brought our raft from Montana and we wanted to leave his truck so we wouldn't have to pay $500 to shuttle it. Yep, that's right - the trek from our put-in (Corn Creek), to take-out (Carey Creek) was so long (383 miles / 616 km) that the shuttle company charged $500 per vehicle! We had 28 members in our river family on the Salmon. There were more children than adults, and something like 15 watercraft in total. It was epic, it was joyous, it is the source of many lasting memories. I think the kids might've even enjoyed it as much as the adults. Their "gossip circles" where a highlight for them, as was floating in their duckies, and the river romances that developed along the way. This story is best told with Trish's photos, where you can see the many smiles, the clear water, and how the good times flourished.